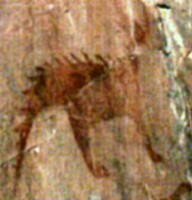 Some authors cite a petroglyph from Big Sandy River (Oregon, USA), in which there is an image of what is claimed to be a stegosaurus. Indigenous tradition mentions a ‘water-panther’, an animal with a cat-like face and a saw-tooth back that inhabited streams and lakes. According to Vine Deloria, a Native American writer, there are numerous pictographs of the ‘water-panther’, warning passers-by of the danger. The authors who use this as evidence that humans and dinosaurs once co-existed (and erhaps still co-exist) gennerally fail to show a reproduction of the petroglyph, making the claim impossible to evaluate. This is the sort of claim that tends to appear in lists of anomalies without authority, a technique commonly found among ‘fringe’ authors. Like so much of this material, it is simply repeated from source to source. The fear is that such fanciful stories develop into factoids. However, it is possible to find images of ‘water panthers’. As can be seen from the example reproduced here, they resemble Stegosaurs in only superficial ways. So.. what are they? Take the the picture above for example, if it isn’t a ”water Panther” or a stegosaurus what is it? I am no archaeologist and i am most certainly not a creationist but to the untrained eye is does resemble some sort of dinosaur. Almost looks like a crocs tail actually. Panthers are a kind of feline and when felines are threatening they arch their backs and their fur can stand on end. If I was trying to say “cranky cats be here” drawing a cranky cat sounds like a pretty obvious thing to do. The anomaly is that the story goes they are water-panthers. Maybe some panthers are seen in water (a bit odd for a feline but not impossible) but are just regular panthers? Or it’s just not a real animal. That’s probably the simplest explanation. For this and most of the petroglyphs, actually. Could it be an ordinary modern lizard? That’s what it looks like to me. To me this painting does not look like a Stegosaurus or any dinosaur at all. For some reason unknown to me all dinosaurs had considerably longer hind legs than front legs. (It might have had something to to with all of them reproducing by laying eggs.) This animal have all four legs of approximately the same length. Combined with the fully upright stance of the legs this means it was intended to look like a mammal. I think it depicts a local fictitious animal and is no more realistic than that. Dinos have the large hind legs because all of them branched out from a biped ancestor that had already reduced its front legs. Later, when getting too large to sustain bipedalism, herbivorous dinos still retained relatively short front legs. The Brachiosaurids are a rare exception.